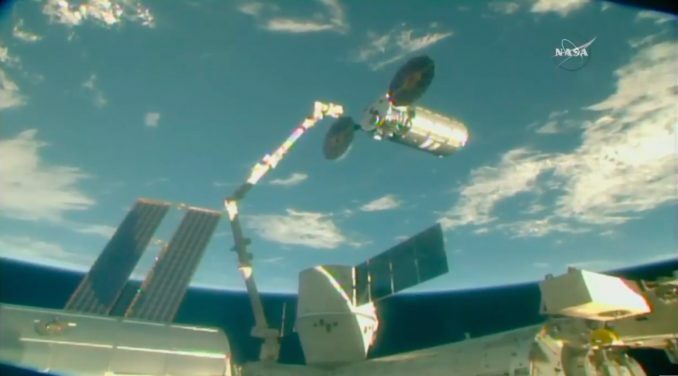 European Space Agency astronaut Alexander Gerst, at the controls of the station’s Canadian-built robotic arm, sent the command to release the Cygnus spacecraft a few hours after the supply ship was removed from a berthing port on the station’s Harmony module. 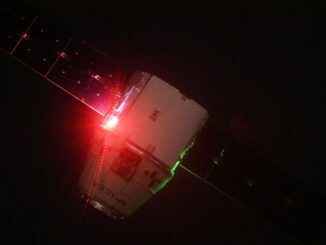 Snares on the robot arm’s hand opened and released the Cygnus spacecraft at 8:37 a.m. EDT (1237 GMT) Sunday, while the space station soared 253 miles (407 kilometers) over southeastern Colombia. 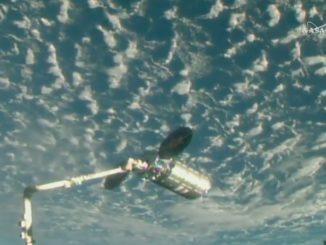 The Cygnus supply ship completed a departure burn moments later, and cameras aboard the station showed the visiting cargo freighter — now loaded with trash — flying away from the research complex, backdropped with brilliant views of planet Earth. The flight plan called for the Cygnus spacecraft to climb into a higher orbit later Sunday, setting the stage for the release of six CubeSats for Spire Global and Aerospace Corp. The six CubeSats, each around the size of a shoebox, will deploy in pairs from a NanoRacks carrier module mounted on the Cygnus spacecraft over the course of several hours late Sunday and early Monday. The CubeSats include four “Lemur-2” payloads for San Francisco-based Spire Global, which builds and operates a fleet of nanosatellites surveying Earth’s atmosphere and tracking maritime traffic. The Aerospace Corp.’s AeroCube 12A and 12B spacecraft will also be released to demonstrate new star-tracker imaging sensors, a variety of nanotechnology payloads, advanced solar cells, and an electric propulsion system on one of the two satellites. The launch and deployment of the Lemur-2 and AeroCube nanosatellites was arranged through Houston-based NanoRacks, which provided the CubeSat carrier module on the Cygnus spacecraft. Following the CubeSat deployments, ground controllers at Northrop Grumman’s Cygnus control center in Dulles, Virginia, will put the spacecraft through additional testing over the next two weeks, then uplink commands for the supply ship to fire its engine and drop out of orbit July 30. The station crew packed around 6,600 pounds (3,000 kilograms) of trash into the Cygnus spacecraft’s Italian-built cargo compartment for disposal during the ship’s destructive re-entry late this month. The Cygnus spacecraft arrived at the station May 24 — three days after launching on an Antares rocket from Virginia — and delivered 7,205 pounds (3,268 kilograms) provisions, experiments and other hardware. 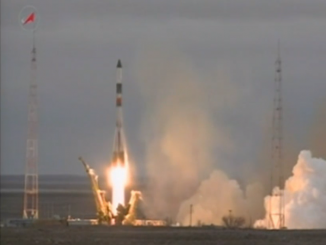 Astronauts unloaded the cargo and replaced it with garbage tagged for disposal. The items carried to the station by the Cygnus spacecraft included NASA’s Cold Atom Laboratory, a quantum physics experiment to explore the nature of ultra-cold matter, probing the behavior of atoms chilled to extreme temperatures colder than the vacuum of space. The Cygnus spacecraft, named the S.S. J.R. Thompson after a former NASA deputy administrator and Orbital ATK executive, also delivered nine other CubeSats that were transferred into the station for deployment through the Japanese airlock. Another first for the Cygnus cargo mission was a test of the supply ship’s reboost capability Tuesday. The Cygnus cargo freighter became the first U.S. spacecraft to raise the station’s altitude since the retirement of NASA’s space shuttle fleet in 2011. The Cygnus only raised the station’s altitude by around 295 feet (90 meters) during a 50-second firing of the ship’s main engine, but future maneuvers could employ longer burns for more significant reboosts. Russian Progress cargo freighters, and the propulsion system on the space station’s Russian Zvezda service module, have conducted nearly all of the research lab’s orbital maneuvers since the end of the space shuttle program, with the exception of a few reboosts by the European Space Agency’s now-retired Automated Transfer Vehicle. Russian mission controllers typically plan several reboost maneuvers per year to counteract the effects of atmospheric drag, which gradually pulls the space station closer to Earth. NASA plans to use future Cygnus missions for additional orbit-raising burns. There are no plans to use SpaceX’s Dragon capsules for reboosts because the Cygnus propulsion system is better-suited for the job, according to Kirk Shireman, NASA’s space station program manager. 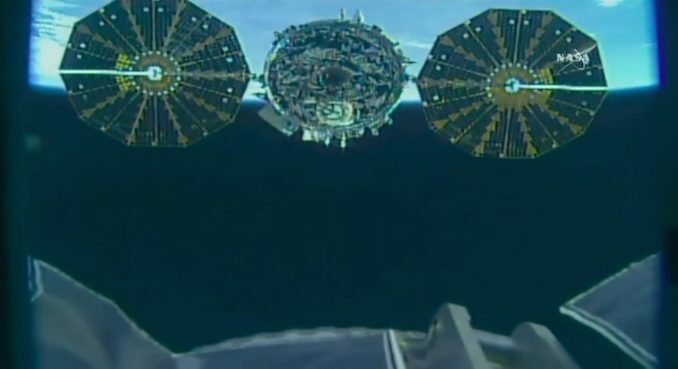 The Cygnus spacecraft received a new corporate owner while berthed at the International Space Station, thanks to Northrop Grumman’s acquisition of Orbital ATK in June. NASA has multibillion-dollar contracts with Northrop Grumman and SpaceX for station resupply flights. The Cygnus mission concluding this month is the ninth operational cargo mission conducted by Northrop Grumman under a contract valued at $2.89 billion, according to the NASA’s inspector general. Northrop Grumman’s next Cygnus mission to the space station is scheduled for liftoff in November, again aboard an Antares booster launched from Wallops Island, Virginia.